Mamaghani, A., Maham, M., Dalir-Naghadeh, B. (2013). Effects of ginger extract on smooth muscle activity of sheep reticulum and rumen. Veterinary Research Forum, 4(2), 91-97. Amin Mamaghani; Masoud Maham; Bahram Dalir-Naghadeh. "Effects of ginger extract on smooth muscle activity of sheep reticulum and rumen". Veterinary Research Forum, 4, 2, 2013, 91-97. Mamaghani, A., Maham, M., Dalir-Naghadeh, B. (2013). 'Effects of ginger extract on smooth muscle activity of sheep reticulum and rumen', Veterinary Research Forum, 4(2), pp. 91-97. Mamaghani, A., Maham, M., Dalir-Naghadeh, B. Effects of ginger extract on smooth muscle activity of sheep reticulum and rumen. 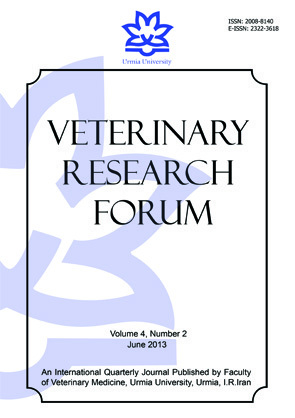 Veterinary Research Forum, 2013; 4(2): 91-97. Reticulorumen hypomotility leads to the impaired physiologic functions of the digestive tract. Prokinetic action of ginger has been demonstrated in the laboratory animals and human. The aim of this study was to evaluate the effect of hydroalcoholic extract of ginger on contraction and motility of reticulum and rumen of ruminants. Collected samples of reticulum and rumen from eight sheep were investigated in vitro. The extract at the concentration of 0.1 and 1.0 mg L-1 had no effect on any preparations. Contraction of reticulum and rumen preparations was occurred at 10.0 and 100 mg L-1 concentrations (p < 0.05). Concentration of 1000 mg L-1 caused a relaxation in preparations contracted with 10.0 and 100 mg L-1. Likewise, the concentration of 1000 mg L-1 significantly (p < 0.05) inhibited ACh-induced contraction in both tissues. Six sheep were involved in electromyographic study. Administration of 40 mg kg-1 of the extract increased the overall frequency of contractions of the reticulum and rumen at the subsequent three days with the prominent increase at the second day (p < 0.05). Results of in vitro study indicated that hydroalcoholic extract of ginger contained spasmogenic and spasmolytic constituents. The results in vivo study represented evidences that the extract may have stimulant effect on reticulorumen motility in 40 mg kg-1 concentration.